There’s no escaping the fact that all gins must contain juniper, but some Australian distilleries – like the Margaret River Distilling Company – are pushing the boundaries of tradition more than ever. Founded by Cameron Syme in 2015, the company stays true to the spirit’s roots by being juniper forward, yet it adopts its own innovative approach by producing contemporary takes on the spirit through its gin brand, Giniversity. Giniversity’s Smoked Hemp Gin, which was released in June of this year following the legalisation of hemp as a food product, is a classic example of just how far the company has taken gin. “We’re always playing around with other botanicals and experimenting with different gin styles,” Syme says. According to Syme, the company had been considering hemp as an additive to gin since coming across hemp food at a supermarket while in the USA – and was hanging out for Australia to catch up and make hemp seed legal for consumption. Also, despite the unique nature of the Smoked Hemp Gin, Syme says it is still predominantly juniper in flavour. Syme adds that Australian distillers are pushing the boundaries of gin, some more so than others, partly because of the country’s law. “We’ve debated it within the distilling industry as gin is not defined in law in Australia. That means there’s a lot of room for innovation in the gin world,” he says. “The global gin market has also been booming for the last five years and that’s now been met with a lot of new distilleries opening up, and a lot of distilleries are doing amazing things. 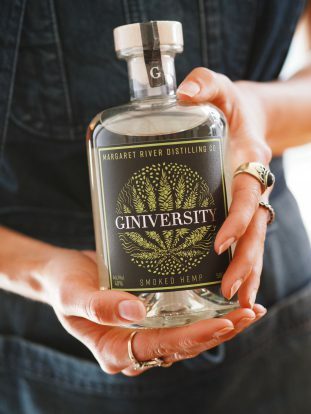 Another trend in Australian distilling at the moment is collaboration, and Giniversity’s latest is no exception – having been produced in collaboration Margaret River Hemp Company. 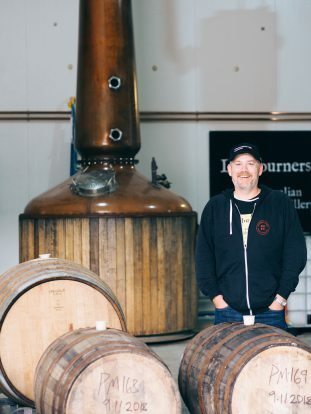 Another collaboration worth noting is one that Syme’s company has been working on for some time – between two of its distilleries, Great Southern Distilling Company and Margaret River Distilling Company. While exact details are still TBA, he reveals that it will stem from each distillery’s flagship brands: a Giniversity Gin aged in Limeburners Whisky barrels. “This product is an absolute cracker too, and the first small batch will be released in the new year,” Syme says. Stay tuned. Method: Pour spirit and tonic over plenty of ice and stir gently. Add white grapefruit, bay leaf and dried chilli as garnish. Method: Fill mixing glass with ice and stir in the vermouth. Discard contents of mixing glass into martini glass, already partially full with ice. Add the gin and brine to the mixing glass and stir. Empty the martini glass so that it is chilled and empty, having been rinsed with the vermouth. Single strain the contents of the mixing glass into the martini glass. Float the Peated Whisky atop the beverage and garnish with 3 olives.